HOUSTON  (Dec. 16, 2008)  The ailing U.S. economy sent ripples across the greater Houston area in November as fewer properties were bought and sold versus one year earlier. According to new monthly data compiled by the Houston Association of REALTORS® (HAR), overall property sales fell 33.7 percent last month when compared to November 2007, with sales of single-family homes down 31.7 percent. Rental properties remained in demand for the month, with leases of single-family homes up 16.0 percent and townhouses/condominiums up 2.8 percent on a year-over-year basis. The average price of a single-family home dropped 7.0 percent last month to $187,766 from $201,862 in November 2007. At $137,500, the median price of a single-family home in November fell 7.7 percent year-over-year. The median price represents the figure at which half of the homes sold for more and half sold for less. However, on a year-to-date basis, home prices are 2.0 percent above 2007 levels, continuing to place Houston on more solid footing than markets throughout California, Florida and Nevada that have experienced double-digit home depreciation since the housing market downturn began more than a year ago. Sales of all property types in Houston for November 2008 totaled 3,906, off 33.7 percent compared to November 2007. Total dollar volume for properties sold during the month was $719 million versus $1.1 billion one year earlier, a 37.4 percent decline. During a late November stop in Houston, National Association of REALTORS® Chief Economist Lawrence Yun praised the stability of Houston home prices and predicted that Houston and Denver would be the nation’s top performers in 2009. Yun forecast at least a five percent increase in Houston home pricing, also noting that local month’s inventory has held around six months while the national rate has been approximately 10 months, another positive indicator. He stated that despite weakness in the oil patch, overall local job growth would help Houston maintain its healthier performance relative to the nation. We are encouraged by Dr. Yuns outlook for our market and hope that as Congress and the Obama administration iron out details of the federal financial bailout plan, local consumers realize that 2009 promises to be a sound time to buy or sell a home in Houston, added Levitin. The number of available properties, or active listings, at the end of November fell 9.3 percent from November 2007 to 47,354. Thats 1,662 fewer active listings than October 2008, and is seen as an indication that inventory levels are balanced and that home prices should remain stable. Month-end pending sales  those listings expected to close within the next 30 days  totaled 3,144, which was 24.4 percent lower than last year and suggests another likely sales decline next month. The months inventory of single-family homes for November came in at 6.1 months, unchanged from one year earlier and the lowest level since February of this year. At $187,766, the average sales price for single-family homes dropped 7.0 percent from November 2007 when it was $201,862. The median price of single-family homes in November was $137,500, off 7.7 percent from one year earlier. That compares to the national single-family median price of $181,800 reported by the National Association of REALTORS®. These data continue to demonstrate the higher value and lower cost of living that prevail in the Houston market. Additionally, total November sales of single-family homes in Houston came in at 3,401, down 31.7 percent from November 2007 and the fifteenth straight monthly drop. HAR also reports existing home statistics for the single-family home segment of the real estate market. In November 2008, existing single-family home sales totaled 2,833, a 28.3 percent decrease from November 2007. At $164,694, the average sales price for existing homes in the Houston area fell 12.1 percent compared to last year. The median sales price of $125,200 for the month was also down 8.7 percent from one year earlier. The number of townhouses and condominiums sold in October fell compared to one year earlier. In the greater Houston area, 421 units were sold last month versus 534 properties in October 2007, translating to a 21.2 percent decrease in year-over-year sales. The average price of a townhouse/condominium dipped to $155,235, down 4.2 percent from one year earlier. 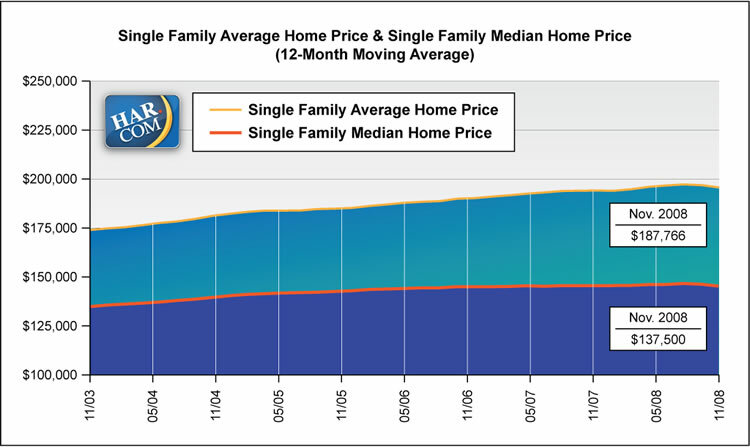 The median price fell 9.8 percent to $118,250 from November 2007 to 2008. Demand for single-family and townhouse/condominium rentals increased again in November. Single-family home rentals rose 16.0 percent in November compared to a year earlier, while year-over-year townhouse/condominium rentals were up 2.8 percent. Fewest active listings since December 2006 (30,167).